Reporters who bravely or foolishly violate Hamas’ rules [barring mention of Hamas at the hospital–ed.] even on their social media accounts can be seen to repent with such alacrity that it’s not difficult to imagine how scared and dependent they are. 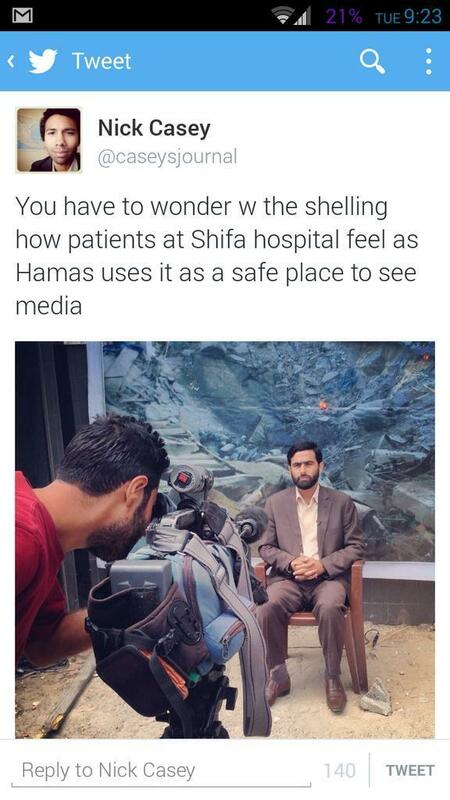 Nick Casey of the Wall Street Journal, for example, tweeted that “You have to wonder w the shelling how patients at Shifa hospital feel as Hamas uses it as a safe place to see media.” Casey then quickly deleted his tweet, which didn’t save him from being put on a list of journalists who “lie/fabricate info for Israel” and “must be sued” – a threat which is surely the least of Casey’s fears. Last week, French-Palestinian journalist Radjaa Abu Dagg was summoned to Shifa by Hamas and interrogated. He wrote about the experience of “attempted intimidation” for Liberation—and then quickly had the paper take down the article. You would think that media organizations would prove that they are worth their salt by defying Hamas’s threats and reporting on the fact that it has command bunkers underneath Shifa Hospital. You would, alas, be wrong. Instead, media organizations seek to curry Hamas’s favor–in part because failing to do so may well have deadly consequences; Hamas, after all, is not known for tolerating dissenting views–by refusing to reveal to the rest of the world the full scope of Hamas’s atrocities and crimes, and by focusing their outrage on the fact that Israel has decided to defend itself from assault. It is bad enough that there are anti-Semites out there who are never going to be disposed to believe that Israel does anything right. It is even worse that there are people of good will out there who are getting bad information from media organizations because those organizations have allowed Hamas to put the knife to their throats.